Description: The Caucasus is the geographically-isolated mountainous region north of Persia between the Black and Caspian Seas. The diverse population of this area primarily consists of Armenians and Azeri Turks; however large groups of Georgians and Kurds also inhabit and produce rugs in this territory. The designs illustrated in these weavings are sparsely decorated with large-scale patterns of stylized flora appearing as abstract geometric elements. The impact of these designs is heightened by the usage of a limited number of contrasting primary colors. The Karabagh region in the southern Caucasus has produced carpets since the 13th Century. Rug production developed significantly during the second half of the 19th Century, when carpet weaving commenced for commercial purposes. 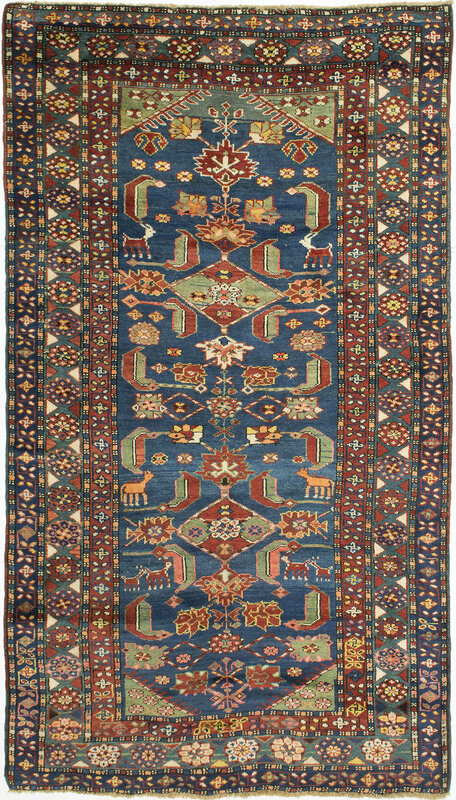 The carpets from this region tend to have very graphic designs woven in primary colorations comparable to the Kazak rugs woven directly to the north. It is generally accepted that examples from the southern part of this mountainous region employ more curvilinear ornamentation due to the proximity of Persia.